A personalised solid oak board with the waney edge exposed creates a unique family heirloom, your very own family tree. Each item is made individually from your information in one of two styles - with the roots or without the roots. The board also bears the quote 'Like branches on a tree we all grow in different directions, but our roots remain as one' This can be amended to roots remain, strong, united, firm anything you like and is best fitting for your family. 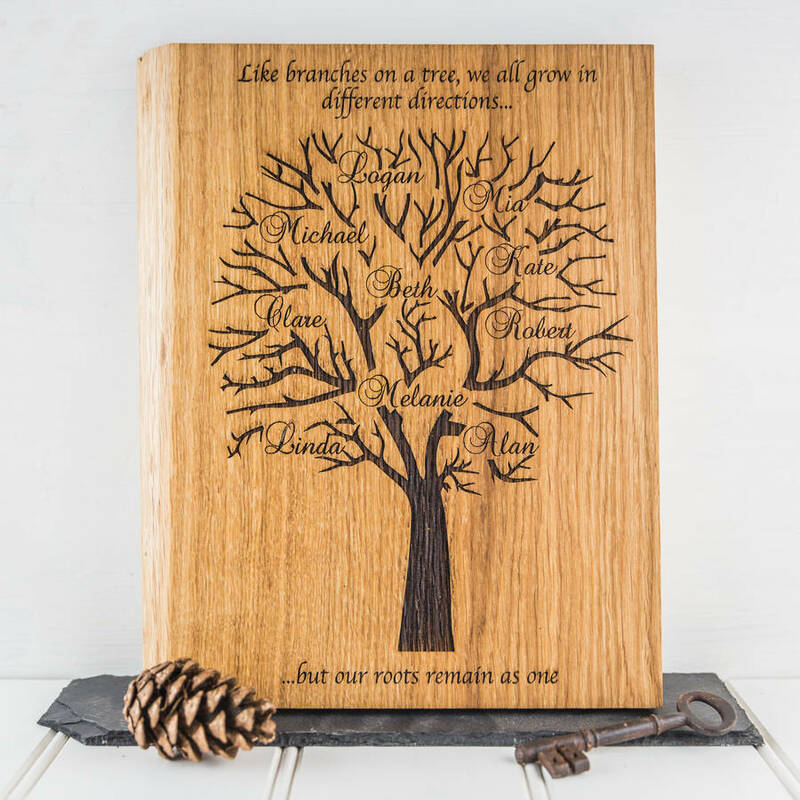 A great gift or treat for yourself to commit the names of your family onto your very own family tree - and by having it engraved onto our beautiful Oak board it really is your very own Ances-Tree! The board hangs flush to the wall, with minimum fuss to offer a stylish and subtle wall hanging. To select the names you would like to include, the design type you prefer and the ending of the quote - please enter your details in the appropriate options box. If you require a larger board than is currently on offer as standard please do get in touch, size is not an issue, and we can simply set you up a bespoke order. PLEASE NOTE, once you have placed your order and we have drawn up the artwork, we will send you an attachment so you can see the proof of your product before we engrave your oak board. We need you to confirm back to us that you are happy with the layout, wording and that all spellings are correct before we can make up your bespoke product.